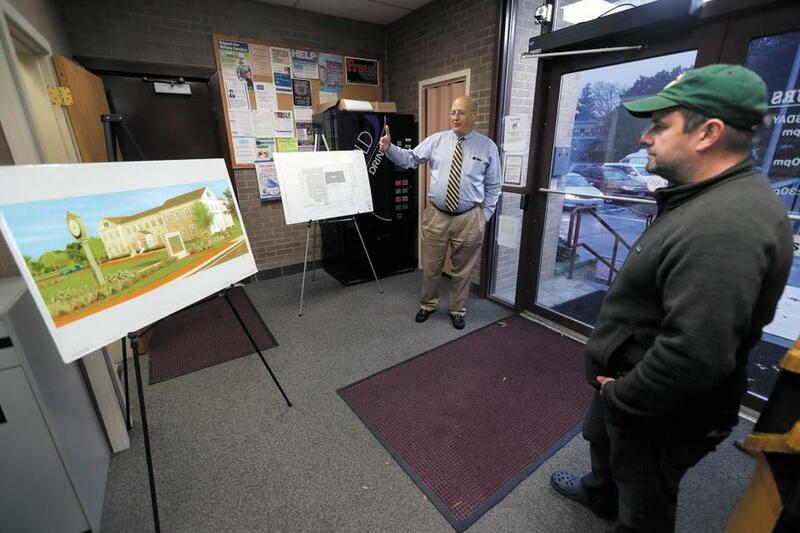 Sharon resident Lajos Kamocsay listened as Town Administrator Frederic Turkington Jr. spoke about the proposed new town hall during a tour of the existing town hall in October. SHARON — There’s the bathroom with a wheelchair-accessible sign on the door, but a door frame too small to let in every type of wheelchair. There’s also the temporary ramp that allows people who use wheelchairs to pass through the front door of the building. But they won’t get far: There’s no elevator to the second floor, and a chair lift stopped working years ago. 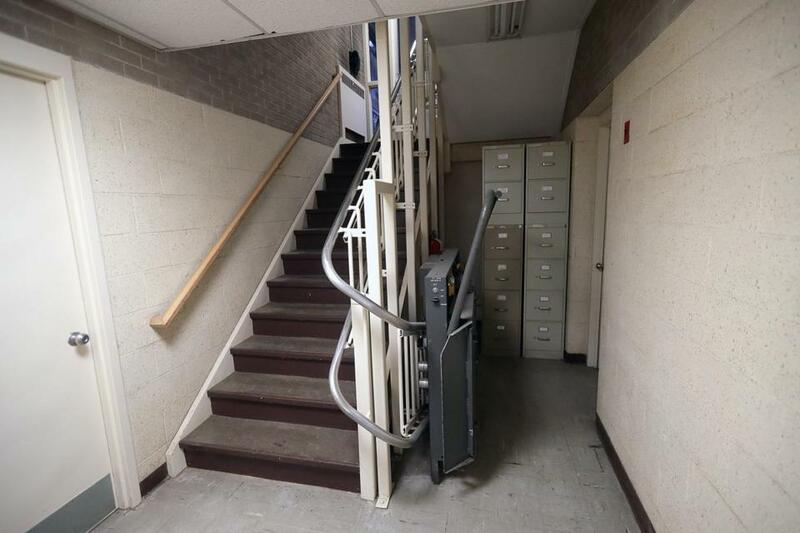 A nonfunctioning chair lift in the basement of Sharon town hall. Sharon, where diversity and inclusivity are a point of pride, has a town hall that is distinctly unwelcoming to people with disabilities. “All people are welcome in Sharon,” Board of Selectmen chairman J.J. McGrath said to a packed auditorium during a recent special Town Meeting. But what if the town hall excluded a group of people from entry? Some key numbers on the new town hall proposed for Sharon. Following the pleas from McGrath and others, Sharon voters agreed a drastic change is necessary and voted to spend $13.5 million on a new building that will be accessible to people of all abilities. It would open in fall 2019 on the site of the former fire station at 90 South Main St., and should serve the town of about 18,000 people well into the next 50 years, said Town Administrator Fred Turkington. But while voters accepted the plan, some expressed concerns about the number of major projects in play in Sharon in such a short time. A new $22 million police and fire complex just opened. There are plans to overhaul or replace the crowded, outdated high school, with a price tag that could hit $120 million. And in five years, the town hopes to replace the public library. Design consultants had offered the Board of Selectmen three options for how to make town offices compliant with federal accessibility laws, and the board chose the most expensive option, some residents noted. Resident Joel Alpert suggested that Town Meeting support one of the cheaper options that would cost $9.6 million. It calls for renovating the existing building instead of building new, and saving the vacant fire station for storage. Town officials rejected that proposal. Gordon Gladstone, chairman of the town’s Standing Building Committee, said that there wouldn’t be enough money in that option to relocate town offices while renovations are underway, and that there is no way to keep Town Hall running and renovate the building at the same time. The original plan to spend $13.5 million was approved by 73 percent of the voters at the meeting. Turkington said he expects the town will borrow $10.8 million and pay for the rest of the costs with free cash and other sources. Officials say the building now on the drawing boards will be able to host public meetings, which for the last two years have taken place in the town’s community center because of the accessibility issues at the town hall. It will also allow for modern methods of archiving public documents, and expanded parking. The new offices will be built on slab and won’t have a basement, saving the town $1.5 million, Turkington said. 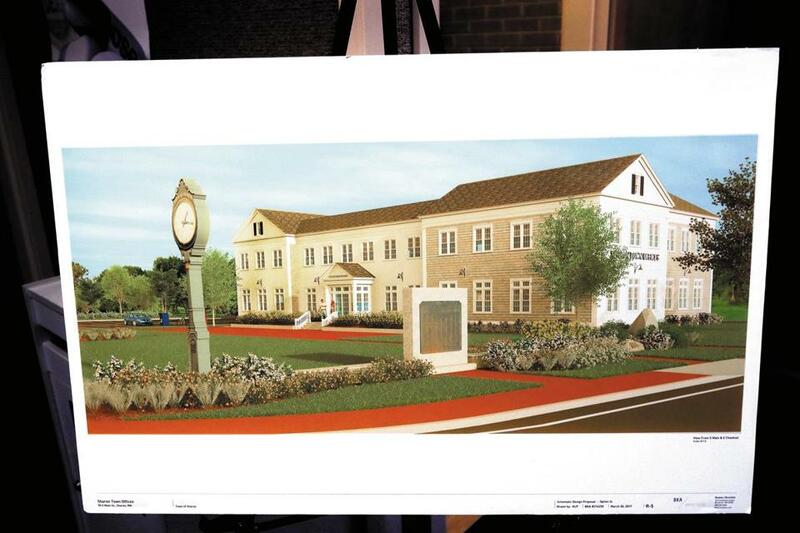 A rendering of the proposed new Sharon town hall. The bigger space will also better accommodate early voting in federal elections. In 2016, 35 percent of voters in Sharon cast ballots before Election Day, Turkington said. Once the new building opens, the old one will be razed and, by the spring of 2020, a parking lot will go in its place. The existing town hall opened in 1964 and is crammed with boxes filled with papers, has small offices that separate workers in the same departments, and has inadequate heating and cooling systems for employees and the town’s computer servers. Meanwhile, until the town brings its offices into compliance with federal accessibility laws, it faces a threat of fines of $1,000 per day, Turkington said. An exterior view of Sharon’s town hall. 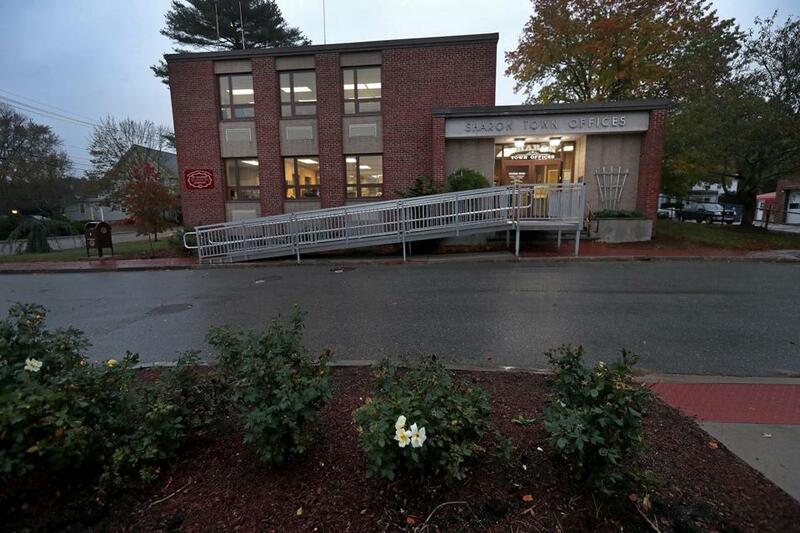 Town leaders assured voters that the cost of the new town hall, as well as a $1.9 million high school study approved by Town Meeting unanimously, will not affect the local tax rate. Property owners in Sharon are paying $19.37 per $1,000 of assessed valuation, down slightly from $19.62 last year though still high relative to other towns. The average tax bill will rise 2.3 percent because of the increase in assessments. Turkington said the town has retired some debt, allowing it to take on more debt without raising taxes. Payments on debt in 2019 would not increase over payments made in 2018, according to the town Finance Committee. To help with upcoming expenses, town leaders are looking to expand the local commercial tax base, and are hopeful that a new retail and residential development near Interstate 95, Sharon Gallery, will bring in $2.4 million in tax revenue, net of town expenses related to the project. The planned mixed-use development has the support of town officials and has won a vote on a zoning change allowing residential uses and retail drive-throughs on its 90-acre site. Owner David Spiegel plans to develop 59 acres with retail stores, such as a grocery store, pharmacy, and small shops, as well as restaurants, a hotel, and market-rate and affordable residences. The rest of the site would be preserved.